Timeflies and Pandora Team Up For A Fun Pop Up Concert in D.C. 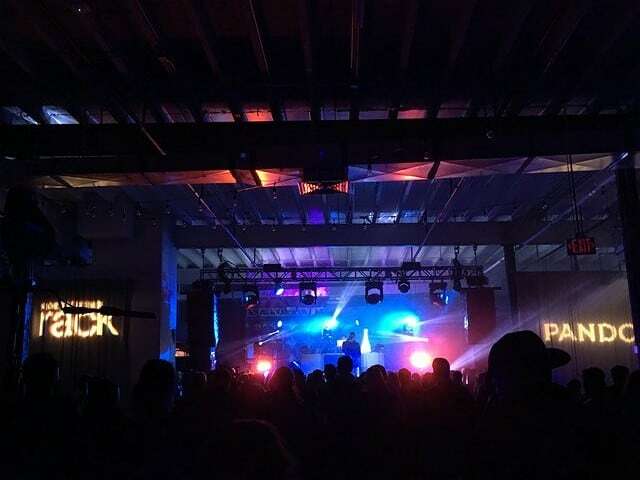 Right next to Union Market, Dock 5 was rocking earlier this week when Timeflies paired up with Pandora and Nordstrom Rack to present a pop up concert. Dock 5, an open floor plan 12,000 square foot warehouse, had several small tables placed around the warehouse, with a large space in front of the stage open. The event started at 7 p.m. with drinks and small finger foods for the guests to enjoy while pop tunes played over the loudspeaker. Lights were synched up to the music playing, and everyone mingled and took photos in the pop up photo booth. Just after 8:30 p.m., the music was turned up and the stage lights began to flash faster and brighter, amping up the crowd as we waited for Timeflies to come on the stage. The clear area in front of the stage filled up with people, as everyone grabbed their drinks, and jostled to get as close to the stage as possible. When Timeflies came out on stage, the crowd cheered, and they immediately began their set. With each song, the crowd got more and more excited. Timeless certainly brought the fun atmosphere to the event, and the crowd was loving every moment of it. They gave a performance that won’t be forgotten any time soon by those lucky enough to be in attendance! TEDxMidAtlantic Takes Place in D.C.